Fred Hersch has always been one of my favourite pianist. His style is elegant, emotional and intelligent. Hersch has been prolific in various settings including duo, trio, quartet, quintet and orchestral. But the one setting that many (including myself) love the most, is his solo outings. Hersch is someone who takes a tune and transforms it into more than just melodies. He creates stories. 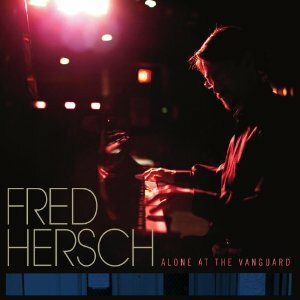 Fred Hersch's latest story is taken from a series of sold out nights at the legendary Village Vanguard in New York City. For once I was smart enough to get my arse downtown to see him solo. I have since him in duo and quartet settings but never solo; until this particular week of shows. I only went to the second night and as usual it was mesmerizing. Alone At The Vanguard documents the final evening of that series of performances. The intimacy and beauty of this evening is what will really grab you when you listening to a track like "Echoes", an original piece Hersch piece. It's a rich, lush piece that finds Hersch moving up and down the scales in a calm but exalted manner. A nice signature moment of Hersch's quality. After listening "Echoes" you will realize how important Fred Hersch is to jazz music. "Memories Of You", one of my favourite standards is more intimate than ever in the masterful hands of Hersch. It's heartfelt and he basically opens the door for you to see and hear the detail of each note. A clear perception and tone that is unlike many other pianist of his generation. Monk has definitely been an influence on Hersch (he has already recorded an album of just Monk covers). But there are probably only two musicians who can really re-imagine a Monk tune--Jason Moran and of course Fred Hersch. On "Work", a song Hersch has already covered on the three disc set, Songs Without Words (Nonesuch; 2001), he again takes the Sonny Rollins/Thelonious Monk piece and energizes it with playful confidence. The Sonny Rollins standard "Doxy" closes out what must have been a perfect evening for the audience. The forceful yet emotional and sometimes blues-inflected tone Hersch adds is another example of his creative interpretation. Alone At The Vanguard is another solo masterpiece from a truly great master of the instrument. Live is always the best way to see Fred Hersch, but if you can't make this is the best document to be a part of the experience. Highly Recommend.